Using portable cleaning machines can do a good job, but can use a lot of cleaning solutions, a lot more time to clean, and the carpet can take a long time to dry. The water a portable machine uses to clean with can only be as hot as the water from your faucet. For every 18 degrees over 118 the chemical action of the cleaning solution doubles. Also, the dirty water recovered by the machine usually gets disposed of in the home. The water used to clean with on a truck mount cleaning machine is heated by the cleaning system, constantly maintaining heat over 220 (170-190 at the carpet fiber). That’s a lot more chemical action and a MUCH better clean. The increase in heat helps to more effectively break down soil, grease, and other spots for more complete removal. Also, this means less cleaning solution used for a healthier environment for all and the dirty water is recovered in the truck mount to be disposed of properly. 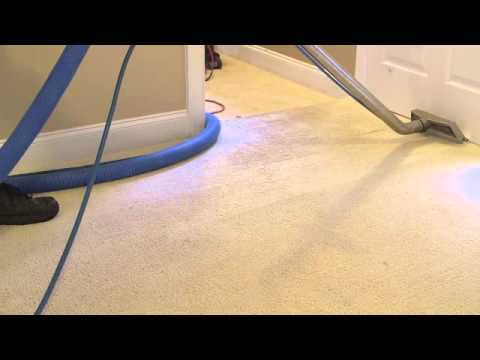 In order for your carpets to be cleaned effectively, the cleaning solution must be rinsed out completely. If not, the remaining solution will collect soil causing your carpet to get dirty faster. A portable cleaning machine is usually capable of 125-150 PSI. That is not a lot! A carpet should be rinsed at 300-400 PSI, which a truck mount cleaning machine is more than capable of achieving. The higher PSI also helps to agitate the fibers, spots, oils and soil for a cleaning result. Vacuum power is the next big difference between the two cleaning machines. Truck mounts have much more power than portable machines. Even though truck mounts have higher water pressure, the vacuum is powerful enough to have most carpets completely dry in 4-6 hours or less. Portable machines do not have this capability. Most portables will require overnight for the carpets to completely dry. This can causes stains to wick back up to the surface during the slow drying process. Better vacuum suction also means better extraction of spots, soil, grease, dust, and many other contaminants from the carpet. Truck mounts are a better clean for the consumer. Hotter water, higher heat, water pressure and better vacuum suction all mean a MUCH BETTER overall clean for the consumer.